Law Herald is a research and practice specialized journal that allows displaying the results of the most important areas of theoretical and practical research in the field of law, achieved by the representatives of National University “Odessa Law Academy” and other universities and research institutions of Ukraine. Law Herald was founded in 1993 by National University “Odessa Law Academy”. For already 20 years, the journal discusses specific scientific issues, reports on the achievements in research areas and schools developing at National University “Odessa Law Academy”, reflects the methodology of teaching. 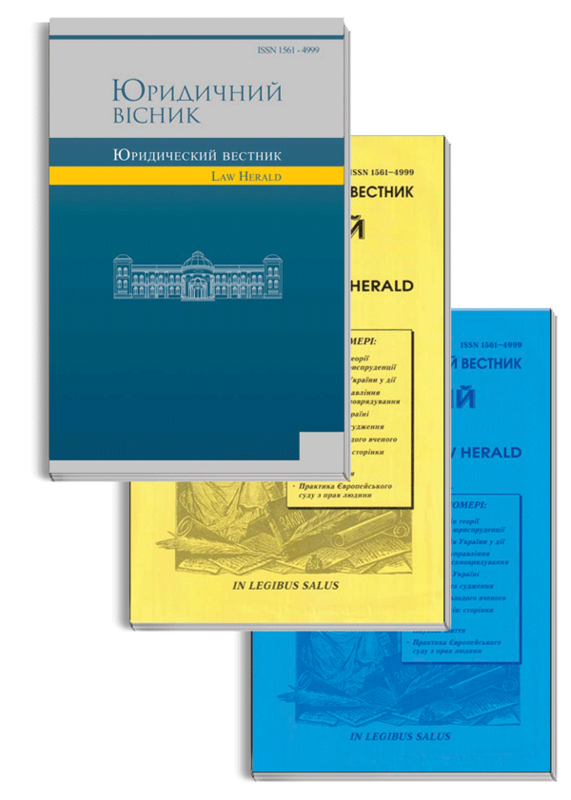 The journal also informs about the events of academic life and legal education in Ukraine, provides a review of scientific papers and books on legal subjects. The journal covers current issues of theory and history of state and law, public administration, administrative law, constitutional law, international law, European Union law, civil law and procedure, agricultural and environmental law, criminology, criminal and criminal procedural law and other branches of law. It publishes papers concerned with the analysis of the judicial practice of the European Court of Human Rights and other international institutions. Law Herald is published for doctors of sciences, candidates of sciences, young scholars (adjuncts, postgraduate students), university lecturers, senior students, lawyers, judges, law enforcement officers and all those interested in achievements of Ukrainian legal science. International Standard Serial Number for periodical publications (Paris, France): ISSN 1561-4999 (assigned on March 18, 1999). National University “Odessa Law Academy” follows the rich tradition of Odessa Law School, whose history is rooted in 1847 (the time of existence of the Law Faculty at Richelieu Lyceum – the first higher educational establishment in Odessa). In 1865, Law Faculty joined the Imperial University of Novorossiysk. In 1997, when legal scholarship and education in Odessa turned 150, Law Institute of Odessa State University was transformed into Odessa State Law Academy. In a year, it has acquired membership in the Association of European Universities, and in 2000 the Academy received the status of national university. The Academy was reorganized into the National University “Odessa Law Academy” by the Decree of the President of Ukraine of September 2, 2010 № 893/2010. According to the decision of the State Accreditation Commission of the Ministry of Education and Science of Ukraine, the University is licensed and certified to conduct educational activities at the highest IV level of accreditation, which allows the provision of higher education to persons (including foreign nationals) at qualification requirements for Specialist’s and Master's degree in Law. 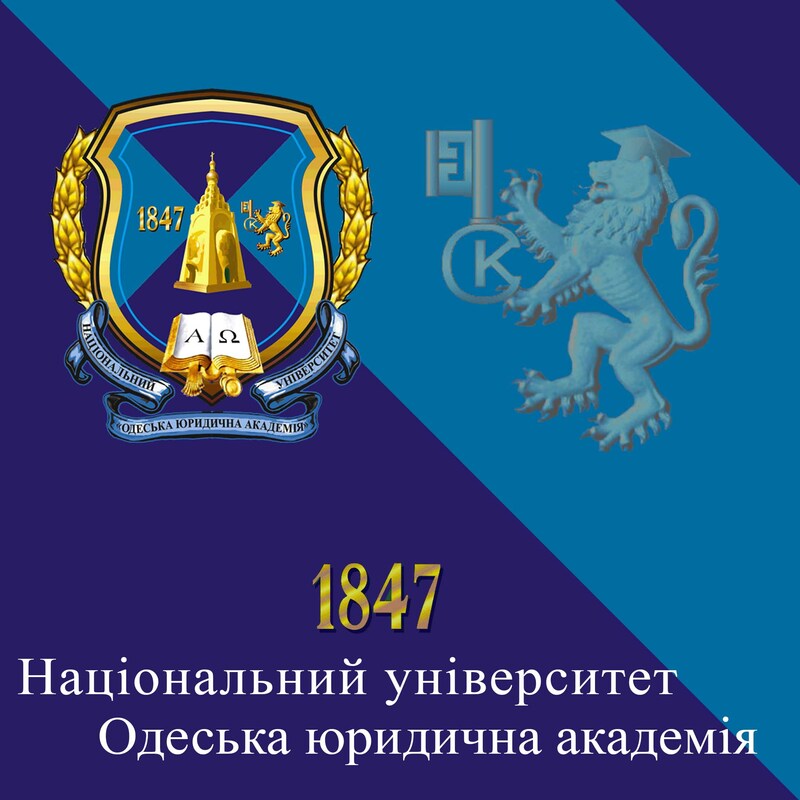 Today, National University “Odessa Law Academy” holds a prominent place among centres of legal education and science of Ukraine, being a leading institution of higher education, the heir of glorious traditions of Odessa Law School, which dates back to 1847. Copyright © 1993-2017. Науково-практичний фаховий журнал "Юридичний вісник"